The Sheriff’s Office would like to extend our sincere appreciation to the Petersburg Police Department and to the media for quickly communicating this information to the public. We would also like to thank all of the citizens who shared this information on social media. Tyquan Montraz Jones, 17, was last seen in the area of Mill Valley subdivision, located in Hanover County on Thursday, August 18th. Jones is described as a black male, approximately 5’7” tall, weighs 155 pounds, with black hair and brown eyes. He was last seen wearing a thin red t-shirt, black undershirt and dark colored shorts. 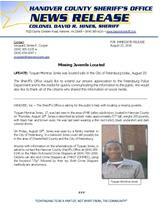 On Friday, August 19th, Jones was seen by a family member in the City of Petersburg. It is believed Jones could still possibly be in the area of Chesterfield County and the City of Petersburg.